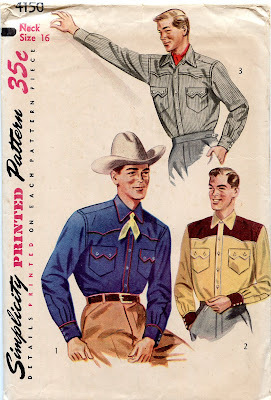 Western shirt patterns for both men and women seem to start showing up in the late 1940s and are still available today. This one is pretty typical for the period, and shows up on eBay quite regularly, so it must have been popular. Suggested fabrics include Cotton, broadcloth, rayon, wool, flannel, denim, gabardine, corduroy, and broadcloth. Doing a good job of piping pointed yokes and shaped sleeve plackets is no joke; this is not a trivial garment to make. 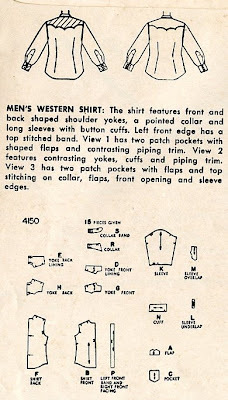 There is nothing like a good ol' western shirt. Love'n the art work on the front of the pattern envelop. Baste, baste, baste! Time spent on preparation will easily be saved when you're topstitching it together without a hitch because your piping is already basted down and your seam allowances lined up. Learned that the hard way. Will never wing it again. Redcrow - I particularly like the hickory stripe version. I imagine that the tan and brown version is in wool. I've got another shirt pattern coming with similar great art work - stay tuned! Latter-Day Flapper- As a maker of western wear I would check myself into an asylum if I had to baste all of my piping before sewing it in! There is a much easier and quicker way than basting... use a zipper foot, sandwhich your piping between your two layers of fabric and snip the allowance on your piping when you come to curves and corners.